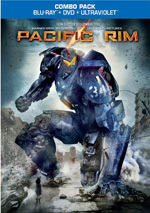 Jake Pentecost reunites with Mako Mori to lead a new generation of Jaeger pilots against a new Kaiju threat. Back in 2013, Pacific Rim looked like it’d offer one of the summer’s big blockbusters. However, it struggled to find an audience in the US, as it barely crossed the $100 million mark, a significantly disappointing sum given the movie’s $190 million budget. Rim did better overseas, though, and it wound up with a worldwide total of $411 million. Due to that aforementioned $190 million budget, I’m not sure it officially turned a profit, but I guess it came close enough to spawn a sequel via 2018’s Pacific Rim Uprising. In the first film, Stacker Pentecost (Idris Elba) sacrificed himself as part of the human war against alien monsters called “Kaiju”. 10 years later, his son Jake (John Boyega) spurns his dad’s choice of career and lives an aimless life after he abandons combat training. When a new threat emerges, though, Jake reluctantly answers the call to go to battle. 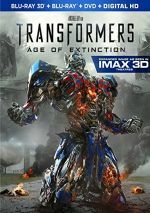 Along with former partner Lambert (Scott Eastwood), Jake goes into the fight as a co-operator of a giant robot called a “Jaeger” and he attempts to save the world from the alien menace. As noted, the first Rim didn’t do gangbusters business, so the existence of a sequel surprises me. Uprising reached an even smaller audience and ended up with a worldwide take of $290 million. This means I find myself even more doubtful that we’ll get a third Rim, but since I never expected a second film, I can’t rule it out. I can say that Uprising leaves me without enthusiasm for another chapter. Generic and without inspiration, this becomes a forgettable action experience. Should it surprise me that the sequel falls short of the original? No, especially because we get a marked change in director in the shift from Guillermo del Toro to Steven S. DeKnight. Now an Oscar-winner for 2017’s Shape of Water, del Toro stands as one of this era’s most respected and acclaimed filmmakers. On the other hand, Uprising marks DeKnight’s directorial debut, as he worked mainly as a TV writer/producer. This shift doesn’t doom Uprising, but it leaves big shoes to fill, and DeKnight can’t compare with del Toro. While I don’t think del Toro made a great film via the original Rim, at least he brought his unique vision to it and gave it a distinctive sense of style. With Uprising, unfortunately, DeKnight fails to display any sense of personality. He doesn’t copy del Toro but he also doesn’t show any real form of cinematic clarity or inspiration. 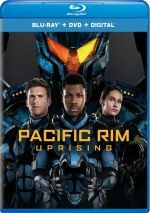 As such, Uprising feels relentlessly generic, and it often seems like a dumbed-down take on the first film’s universe. There’s a Saturday morning feel to Uprising, like it exists to sell toys to pre-teens more than to create a dynamic action experience. It doesn’t help that Uprising barely attempts a coherent story. Sure, it throws out themes and plot notions here and there, but these feel random and don’t come together in a logical, fluid manner. Instead, the film feels more like a compilation of action scenes with little rhyme or reason. We neither bond with nor care about the characters, so we find ourselves detached from the proceedings. A couple of battle sequences boast moderate excitement, but again, DeKnight simply lacks a natural feel for the material. He delivers all the usual cinematic techniques – spinning cameras, quick cuts, etc. – but he can’t find the thrills that should exist, so these moments come across as less than enthralling. Even without del Toro’s unique worldview, Uprising does look good, and it comes with strong production values. However, it just never forms into an interesting, exciting film. 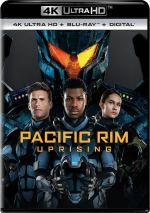 The Pacific Rim universe remains one ripe with the opportunity for lively action, but Uprising fails to exploit that potential in a satisfying manner. 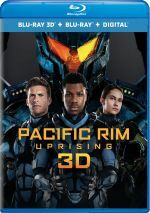 Pacific Rim Uprising appears in an aspect ratio of approximately 2.40:1 on this Blu-ray Disc. As expected, the image looked very good. Overall sharpness appeared positive. Some interiors tended to feel a smidgen soft at times, but the vast majority of the film appeared accurate and concise. I noticed no signs of shimmering or jaggies, and the movie lacked any edge haloes. Print flaws also failed to materialize. Like the first movie, Uprising favored orange and teal. As sick as I am of typing the words “orange” and “teal”, I couldn’t complain about their reproduction here, as the hues looked vivid and accurately rendered. Blacks were always deep and tight, and I saw good contrast as well. Shadows seemed clear and appropriately opaque. The Blu-ray became a largely strong reproduction of the film. I felt even more pleased with the movie’s impressive Dolby Atmos soundtrack. Downconverted to Dolby TrueHD 7.1, the mix used all the channels in a lively, involving manner. Vehicles, weapon-fire, aliens, robots and similar elements popped up from all around the room and delivered a smooth, engrossing soundscape. Effects became the most prominent component, of course, and packed a solid punch, with positive clarity and range. People invest major bucks in home theaters for flicks like this, and Uprising delivered the goods. The disc provides a nice array of extras, and these open with an audio commentary from co-writer/director Steven S. DeKnight. He offers a running, screen-specific look at story/characters, cast and performances, editing and effects, stunts, sets and locations, and connected domains. Though DeKnight provides a peppy chat, he never quite gives us anything scintillating. We get a more than competent overview of the production but not one with great insight. Eight Deleted Scenes fill a total of six minutes, 56 seconds. These tend toward minor character extensions and exposition – plus a brief cameo from Guardians of the Galaxy director James Gunn. Some decent information emerges but I can’t claim any of them seem really memorable. We can watch the scenes with or without commentary from DeKnight. He tells us about the sequences and why he cut them. DeKnight adds good insights. A slew of featurettes ensue, and these open with Hall of Heroes. It runs three minutes, 25 seconds and includes remarks from actor John Boyega. He provides a brief overview of the movie’s Jaegers. We get a basic feel for the different robots. With Bridge to Uprising, we locate a four-minute, 39-second piece with Boyega, DeKnight and actor Scott Eastwood. The show looks at connections to the first movie and various story/character areas. “Bridge” becomes a minor expansion of topics. Next comes The Underworld of Uprising, a three-minute, 47-second reel with DeKnight, Boyega, and actor Cailee Spaeney. We get more rudimentary character thoughts here – it’s a forgettable reel. During the five-minute, 58-second Becoming Cadets, we hear from Boyega, DeKnight, Spaeny, cast trainer Naomi Turvey, and actors Karan Brar, Rahart Adams, Ivanna Sakhno, Levi Meaden, Shyrley Rodriguez, Mackenyu, Lily Ji, and Wesley Wong. This one looks at the movie’s cadets. It turns into another clip with a smattering of informative bits and a lot of hype. Spoiler alerts come from Unexpected Villain, a five-minute, 48-second featurette with DeKnight and actors Burn Gorman and Charlie Day. We find another take on supporting characters – and another mediocre promo piece. We learn more about the film’s robots via Next Level Jaegers, a five-minute, eight-second featurette with Boyega, DeKnight, Meaden, Brar, producer Cale Boyter, production designer Stefan DeChant, and visual effects supervisor Peter Chiang. “Level” gives us design details about the Jaegers and provides a fairly informative little show. I Am Scrapper takes up two minutes, 42 seconds and features DeKnight and Spaeny. They chat about the “homemade” Jaeger but don’t give us much insight. After this we find Going Mega, a three-minute, 21-second reel with DeKnight, Day, and Chiang. They tell us a bit more about various Kaiju in this brief but moderately useful piece. During the three-minute, 14-second , we get thoughts from DeKnight, DeChant and actor Jing Tian. Once more, we receive additional character bits that bring a little substance but not much. Finally, Mako Returns goes for two minutes, eight seconds and includes comments from DeKnight, Boyega, Boyter, and actor Rinko Kikuchi. It’s another brief character-related piece without much depth. The disc opens with ads for Jurassic World: Fallen Kingdom, Tremors: A Cold Day In Hell, Universal Parks and Skyscraper. No trailer for Uprising appears here. A largely listless, semi-coherent sequel, Pacific Rim Uprising fails to live up to the modest standards set by its spotty predecessor. Staged with weak plotting and erratic action, the film lacks a lot of obvious positives. The Blu-ray presents pretty good picture along with excellent audio and a long but often superficial collection of supplements. Uprising turns into a forgettable effort.